Handball coaching guru Kang Jae-won arrived in China eight months ago to coach the national women's handball team. The world's most populous nation is the latest destination for the globe-trotting South Korean who spent almost a decade playing and coaching handball in Europe and Asia. Unlike other overseas coaches, Kang said he has never felt lonely because he was just following his heart. "I have become accustomed to the life of a frequent traveler after spending so much time abroad and so little time with my family," Kang said. "However, as a coach, you may feel at home wherever you put your heart. And every time when I take over a team, I just try to put in my heart there. "I always tell my Chinese players that I'm not a Korean, a Chinese nor a European. I am just your coach." A previous "crush" on Team China made the adjustment easier as Kang merged into the team quickly and smoothly and was able to devote himself wholeheartedly to his new job. "I had been watching Team China for a long time before I took over the squad," he beamed. "I like this team a lot because it has a style I appreciate." In his eyes, Team China, with a stronger and burlier group of players, looks more like a European team compared to other Asian sides. That inspired him to build China into a team with a unique pair of qualities - playing fast and fundamental like Asians and strong and explosive like Europeans. "That kind of play should blend with the team and I am sure the team can be better by working this way," Kang said. His idea has won approval from Chinese officials who initially appointed Kang because of his extensive coaching experience in Europe. Kang, a handball star in the 1980s and the world's best men's handballer in 1989, worked for 18 years as a coach in Europe, once leading a Swiss club to the final of the European Cup. 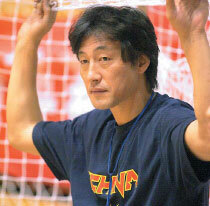 He moved to Japan in 2005 and helped his team win the Japanese handball league the following year. "I believe our players can learn the best aspects of European handball under Kang's coaching," said team leader Deng Li. Kang's coaching has had an immediate effect on the team. During the four-nation International Elites Tournament held in Anhui province last year, China defeated world champion Norway and European powerhouse Spain before losing to former world and Olympic champion South Korea by a single point. The inexperienced team was quickly brought back to earth, however, losing all three group matches at the World Championships where it eventually finished 21st. But Kang took the losses in stride. "I like China and I like challenges," he said. "I wouldn't be here if I did not believe I could make a difference on the team." Kang, the fourth South Korean coach of the team, hopes the team will follow in his country's footsteps and become a world-class handball team as South Korea did after its home Olympics in 1988. "I am looking forward to a medal in the coming Olympics in Beijing," he said.